The institute for Plastination — organizers of the renowned Body Worlds anatomical and health exhibitions — presents a special new exhibition for the times we live in. 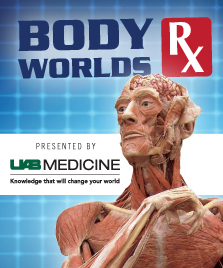 A curation of the latest research in health prevention and wellness, BODY WORLDS Rx is an unforgettable educational exhibition that will resonate with the health conscious viewer. This public health experience features a collection of authentic human specimens including whole-body plastinates, organs, translucent body slices and body configurations that show complexity of the human body and its vulnerability to illness and diseases.